This is as competitive a six-horse field as you’ll find. Each of the six runners has a legitimate chance to win this race. The two competitors that are likely to attract the most play are Thirst for Glory and Testosterstone, who both exit the same May 7 race. Testosterstone (#4) was excellent that day, chasing a quick pace four-wide before pulling away to a clear lead in mid-stretch. He ultimately got nailed late by Extinct Charm, which is no disgrace considering what that one has done in subsequent starts. He was overmatched against open N1X allowance foes last time, but lands back in with his own kind today. Thirst for Glory (#2), on the other hand, hasn’t run since then. He’s earned some of the fastest speed figures in the race, but he really needs everything to go his way to come out on top, and we’re not sure he’s going to get enough pace to close into here. Beyond the Green (#3) didn’t handle the mud in that May 7 race, but his prior efforts are better than that. However, like Thirst for Glory, he may find himself compromised by the lack of pace. We’re going to take a shot with a bigger price in OWNER GENTLEMAN (#5). This three-year-old has been steadily improving over the course of this year. Three back he pulled away from Nobody Move, who has returned to significantly improve his speed figures. 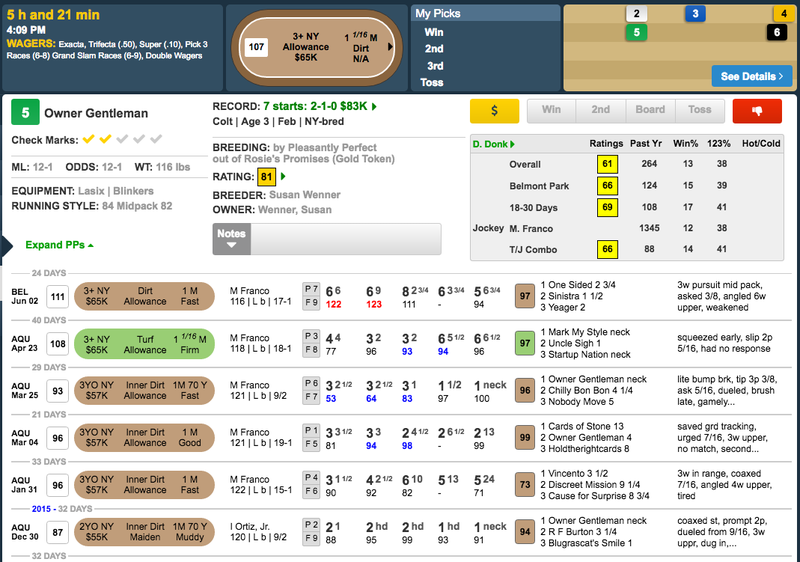 Then last time, he was in a pretty tough spot, but his trip is worth watching since the chart comment fails to mention that he got sandwiched between horses and squeezed back at the top of the stretch. He has the tactical speed to be placed close to likely speed Lyrical Miracle, and we think he’s most likely to move forward here.